Along with the Frozen party comes a new pin. 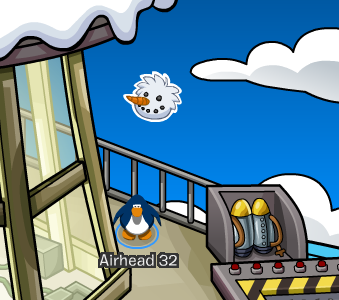 It's the Snowman Puffle pin! Maybe we'll be able to adopt a snowman this month. This pin is found at the Beacon. First step: Open up your map. Click the 'Beach' icon. Second step: Go inside the lighthouse. Third step: Walk up the stairs. Fourth step: Click on the Snowman Pin.